Veteran fullback Jamize Olawale will have another opportunity in Dallas. The 2018 trade acquisition agreed to a new Cowboys deal, according to Jon Machota of the Dallas Morning News (on Twitter). This agreement is worth $5.4MM over three years, per Machota, who adds $2.8MM is guaranteed. Olawale finished his first season with the Cowboys, playing 132 snaps and on special teams. A $1.8MM signing bonus is including in this pact, Calvin Watkins of The Athletic tweets. The Raiders traded Olawale to the Cowboys nearly a year ago. The soon-to-be 30-year-old blocking back was not used as a ball-carrier, which was the case sparingly in Oakland. But he’ll nonetheless stay a part of Dallas’ backfield in 2019. The eighth-year UDFA’s contract falls in line with the non-Kyle Juszczyk wing of this position, Olawale’s per-year salary placing him in the top five among fullbacks. He had previously played out a three-year extension, which he signed as a Raider near the end of the 2015 season. Olawale, 29 in April, has been primarily used as a blocker in Oakland. Over the last three seasons, he has just 55 carries for 200 yards and four touchdowns. He hasn’t been a huge factor as a receiver either with just 27 grabs for 344 yards and one score in that span. Trading Olawale takes $1.6MM off of Oakland’s cap. Meanwhile, they’ve also turned a sixth-round pick into a fifth-round pick in a deal that echoes this week’s Cordarrelle Patterson trade with the Patriots. WEDNESDAY, 10:52am: Having avoided restricted free agency this offseason, Olawale got a signing bonus of $760K on his new deal, with a $1.14MM roster bonus in 2016, tweets Ian Rapoport of NFL.com. According to Rapoport, the extension is worth $6MM in total. 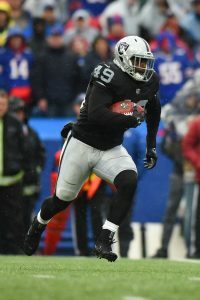 TUESDAY, 4:51pm: The Raiders signed fullback/running back Jamize Olawale to a three-year contract extension Tuesday, according to the team’s website. Financial terms of the deal have not yet been disclosed. Olawale, who went undrafted out of North Texas, joined the Raiders as a rookie in 2012 after they plucked him from the Cowboys’ practice squad. Olawale has since emerged as a key special teamer for the Raiders and has figured more into their offense this season, racking up career highs in touches (32) and total yards (180). He has also added a touchdown, giving him three for his career. We learned yesterday that the Raiders have officially secured all five of their restricted free agents, and Aaron Wilson of the Baltimore Sun tweets today that the team has locked up its exclusive rights free agents as well. Rival clubs couldn’t make a play for those ERFAs, so there wasn’t much suspense about whether or not they’d be returning to Oakland. Defensive end Denico Autry, tight end Brian Leonhardt, tackle Matt McCants, fullback Jamize Olawale, and cornerback Neiko Thorpe are now under contract. Cornerback Antwon Blake, who received the low-end RFA tender from the Steelers last month, has officially signed that tender, according to Wilson (via Twitter). Blake will return to Pittsburgh on a one-year deal for 2015 worth $1.542MM. Former Texans and Bears defensive lineman Amobi Okoye has been released by the Cowboys, tweets Adam Caplan of ESPN.com. Okoye appeared in 87 games between 2007 and 2012 before he was sidelined by a medical issue, and had been attempting to make it back to the NFL — if he intends to continue his comeback attempt, it looks like it’ll have to happen with another team. The Packers have cut tackle Aaron Adams with a failed physical designation, per Weston Hodkiewicz of the Green Bay Press-Gazette (Twitter link). The former Kentucky lineman tore his ACL and MCL during training camp last year and missed the entire 2014 season. The Eagles are considered the favorites to land Mark Sanchez, and it’s hard to determine which other teams may be a threat to Philadelphia for the signal-caller. The Seahawks have been ruled out as a destination, and reported interest from the Rams and Giants has been significantly downplayed. Now, Terry McCormick of TitanInsider.com suggests that another rumored suitor isn’t seriously in the mix, tweeting that the Titans don’t have interest in bringing Sanchez aboard. As we wait to see where the former Jet lands, let’s check out a few more notes from around the AFC…. Chris Johnson‘s future with the Titans remains in limbo, as Jim Wyatt of the Tennessean writes. In a series of four tweets, Tom Pelissero of USA Today explains how Brandon Browner‘s contract with the Patriots works, complete with financial specifics. Field Yates of ESPN Boston (Twitter link) has the details on the playing-time incentives in Michael Vick‘s new deal with the Jets. As Yates outlines, Vick can earn bonuses up to $1MM depending on whether he appears in 50% ($100K), 60% ($300K), 70% ($550K), 80% ($900K), or 90% ($1MM) of the Jets’ snaps. Texans head coach Bill O’Brien plans to attend Jadeveon Clowney‘s Pro Day next week, and is looking forward to continuing the “good talk” he had with Clowney at the combine, tweets James Palmer of CSNHouston.com. Chiefs head coach Andy Reid confirmed that he spoke to free agent receiver Jason Avant, but suggested there’s nothing there when it comes to the team’s interest in the former Eagle. Reid instead hinted that he and Avant may work together down the road, according to Jeff McLane of the Philadelphia Inquirer (Twitter links). Chris Owens‘ one-year contract with the Chiefs is worth $800K, which includes a $730K base salary and a $70K workout bonus, tweets Aaron Wilson of the Baltimore Sun. $80K of Owens’ base salary is guaranteed. Fullback Jamize Olawale has signed his exclusive rights tender to remain with the Raiders, the team announced today (Twitter link). Left tackle Eugene Monroe and the Ravens remain far apart in talks on a new contract, reports Matt Zenitz of the Carroll County Times. It’s still possible that the two sides could work out an agreement, but it appears unlikely to happen before Monroe becomes eligible to hit the open market and negotiate with other clubs, says Zenitz. Aaron Wilson of the Baltimore Sun (Twitter link) also hears that the sides are still far apart, though he says there were no new negotiations today, meaning things haven’t gotten any worse. To the surprise of the players’ agents, the Dolphins have yet to make contract offers to free-agent-to-be defensive tackles Randy Starks and Paul Soliai, reports Barry Jackson of the Miami Herald. It looks like Ernie Sims won’t return to the Cowboys, according to ESPN.com’s Calvin Watkins, who says the team wants to get younger at its backup linebacker spots (Twitter link). The Raiders have tendered contracts to five of their exclusive rights free agents, according to Tom Pelissero of USA Today (Twitter link). Offensive linemen Matt McCants is eligible for the minimum salary for players with one year of NFL experience ($495K), while linebacker Kaelin Burnett, running backs Jamize Olawale and Jeremy Stewart, and cornerback Brandian Ross are eligible for the two-year minimum ($570K). All five players have to accept the tenders if they want to play in the NFL next season. The Buccaneers aren’t expected to tender a contract to restricted free agent tight end Kyle Adams, tweets Greg Auman of the Tampa Bay Times. The team would still have the option of trying to re-sign Adams for less than the RFA tender amount. The Bears are making no attempts to sign Devin Hester, meaning the return specialist appears likely to leave Chicago this offseason, tweets Ian Rapoport of NFL.com. When the Redskins released Adam Carriker today, I wrote that the defensive end would likely have to sign with another team if he hopes to return to the field in 2014, and John Keim of ESPN.com confirms as much (via Twitter). A source tells Keim that Washington won’t re-sign Carriker at a lower price. The Giants have tendered contracts to Spencer Paysinger ($1.431M) and Dallas Reynolds ($570K) while the Browns tendered Craig Robertson ($570K), according to Tom Pelissero of USA Today (on Twitter).